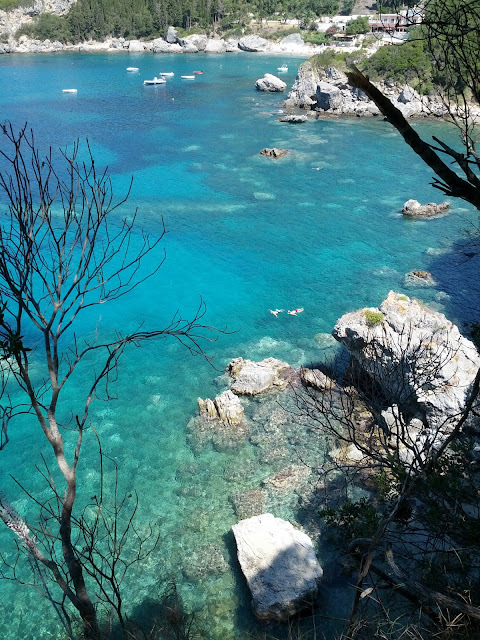 A special article needs to be dedicated to a personal top of the best beaches in Corfu. I would like to highlight the subjective aspect of this list as for some other people priorities could perceive a shift. What I was looking for was a set of factors such as the space & length of the beach, the natural set, the orientation, how easy or not it is reachable, the nature vs built landscape, the commercial side, the cleanliness of the beach and water, the color of the water. It is probably the beach that I liked the most. Its endless stretch, sandwitched between the sea and sand dunes, it gives you space for long strolls and (at the beginning of September) there were hardly few people there. The access point is off Linia village in the southern part of the island of Corfu. 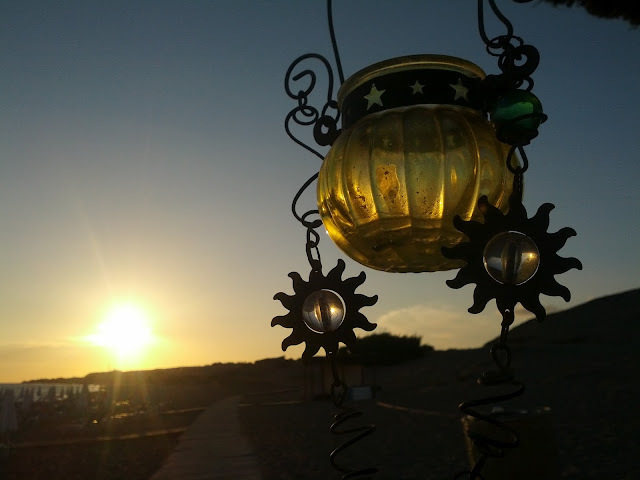 By a dusty parking lot, the beach opens with a rustic bar/terrace with chill out music, pillows, carpets, sun shaped suspended candle holders where you can absorb a frape’ drink and the majestic sun set. Further to the right there is a surf and sailing club. Marketed as one of the most beautiful beach in Europe (hmmm, hmmm), Mirtiotissa preserves the natural habitat and landscape. The scenery is hotel and commerce free. All you can see is the mountain covered in green vegetation, a tiny monastery and few rocky humps coming out of the water. The mountain wall by the beach absorbs the heat of the sun and in the night it makes a perfect source of warmth to the star watchers or the people who camp for free on the beach. The two mini streams of spring water make a perfect shower to wash the sea salt off your skin. The beach is popular with naturist sun bathers (locals and tourists alike) and there is a sort of a community spirit in the air pointing back to the 60’s and 70’s. The bar serves great sandwiches and fruit salad served either with ice cream or yogurt and honey. Miam! The coziness of this beach will make you remember it long time in spite of the large steps shaped hotel and its funicular. The terrace at its southern side is catered by two super hospitable brothers and is an ideal location for snapping that perfect sun set you want to post to Facebook to make friends jealous. South of Paleokastritsa are to be found some of the most spectacular beaches, most of them reachable by boat. They are about 15 of them! Once in Paleokastritsa harbor you will see many boat rental companies. I used the “yellow boat company” and the price I paid was 50 euros for the day plus petrol. Definitely it is a highlight of the holiday. As a practicality, if you are sea sick, make sure you have with you some pills or ginger (the traditional remedy used by sailors for centuries). North of the beach above is Rovinia Beach. White pebbles throughout is flanked by high walls of rocks that make a big contrast with the azure waters. Very popular with families. It is a crowded beach with a solitary floating bar boat and in-and-out moving, hop-on hop-off tourist boats. The most sang and praised beach in the western Corfiot coast, south of Paleokastritsa. Reachable by sea only, it is frequented by the tourists who are unloaded by hop-on-off boats or more daring motor boat riders. It might be very pleasant in the low season, otherwise better to wave to it from a passing by boat. North of Paleokastritsa there are 2 beaches reachable by boat, just down of Krini village. These seem to be the escape beaches for those who are looking for a bit of privacy away from the flocks chasing the Paradise Beach. There are other beautiful beaches like this one that I stopped just to have a picnic on the east (south east) coast around Moraitika. 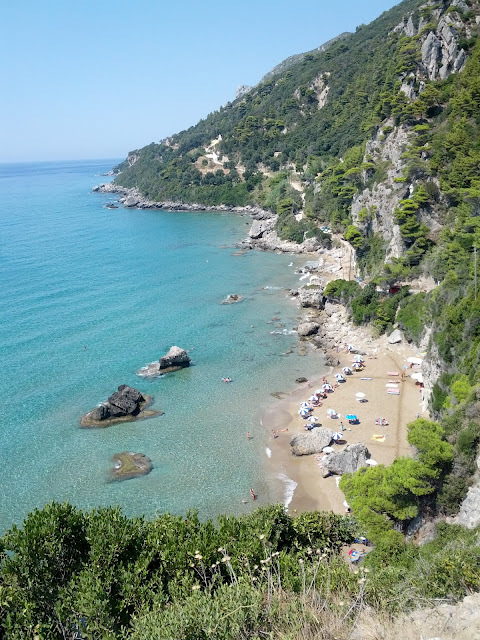 The guides recommend Arillas Beach, near Agios Stefanos (in the north west of Corfu) or Yaliskari Beach, near Pelekas, accessible from Sinarades.